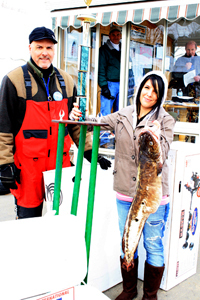 The 33rd Annual International Eelpout Festival will be held February 17, 18, and 19, 2012 at Leech Lake, Walker, Minnesota. The festival is known for a number of activities, including an eelpout ice-fishing tournament and the Bikini Ice Fishing Team Fashion Show. Last year, the individual first-place prize went to Alyssa Lyons (photographed at left with her winning eelpout and huge trophy), who landed a 13.33 pound eelpout (the International Game Fish Association world record is 25.13 pounds). Awards for individual (367.47 pounds) and team (464.89 pounds) tonnage went to Tom Hill and Floyd’s Barber Shop, respectively. Tournament participants caught 335 eelpouts, weighing a total of 1068.5 pounds. That’s over half a ton of eelpout. The eelpout (AKA burbot Lota lota) is the only member of the cod family that inhabits freshwaters. It is most common in streams and lakes in North America and Europe above 40°N latitude. So, technically the festival celebrates the burbot, but eelpout sounds so much more fun. And Beel is all about fun. 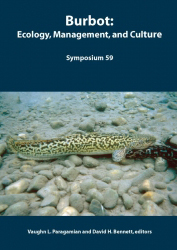 The eelpout (AKA burbot) is not one of your more popular or commonly sought fish, but it is, nonetheless, the subject of a book published by the American Fisheries Society, “Burbot: Ecology, Management, and Culture.” Beel thinks this festival must be the “culture” part. The Eelpout Festival initially was conceived as a way to bring visitors to Leech Lake during the winter. In this regard, the festival is doing something right. Beel presents results from a Google Insights for Search analysis of queries for eelpout. There is a low search volume during most of the year. But come winter, search volume goes way up. Beel also observes that search volume increases from year to year. Word is getting out: there’s eelpout to be had. Beel would love to be there, but is already scheduled to be on the road. This entry was posted on January 24, 2012 by denstormer in Fish Festivals, Fishing and angling, Google Stuff and tagged fish festival, Google Insights for Search, queryomics, USA.